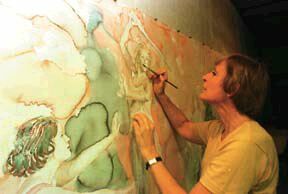 Ruth Weisberg in her studio with a portion of the 28-foot wide, 43-inch high Mysteries, mounted for the occasion of the May 18 Venice Art Walk. Keeping up with Ruth Weisberg – dean of the School of Fine Arts, professor of printmaking, painting and drawing, and an artist whose works are sought after all over the world – can be a challenge. Several exhibitions of her work are in progress or have just closed in locations from Los Angeles to Washington, D.C.
Weisberg is currrently at work in an Italian print studio in a 14th- century Tuscan village, generating new monotypes to be shown at the Gwenda Jay Gallery in Chicago for a Sept. 20 opening. On display at the Judson Gallery in Los Angeles is “A Continuing Tradition: First and Present Deans of the School of Fine Arts, USC – William Lees Judson and Ruth Weisberg,” an exhibition of the work of Weisberg and her predecessor. Weisberg’s contribution includes 11 pieces in mixed media, mixed media over monotype and lithographs. They are installed side by side with seven of Judson’s plein-air (landscapes with natural light) oils and one watercolor. Judson, one of the first impressionists in California, joined the USC faculty in 1896 as professor of drawing and painting. In 1901, he founded and was made dean of the College of Fine Arts, originally located in the Arroyo Seco. The show, which marks 100 years of artistic tradition in Los Angeles, will be open to the public until June 8 at the Judson Gallery (see box). Those who travel to the nation’s capital this summer can look for Weisberg’s work through Aug. 3 at the Smithsonian Institution’s National Museum of American Art in the exhibit “Singular Impressions: The Monotype in America.” This historical exhibition features more than 125 examples of the printmaking medium, in which a painted image is transferred through pressure to a sheet of paper, producing a unique impression. Works by 19th- and 20th-century artists illustrate the progressive capabilities and innovative applications of the process, which began in Europe as early as the 17th century. The Smithsonian exhibition includes works by such 19th-century artists as William Merritt Chase, Charles Alvah Walker and Frank Duveneck; monotypists Maurice Prendergast and John Sloan; and more contemporary artists, among them Weisberg, Richard Diebenkorn, Eric Fischl and Jasper Johns. “In practice,” Weisberg says in the exhibition catalog, “artists’ attitudes toward media are still largely molded by modernist ideas about intrinsic qualities, and even those who decode or deconstruct are reacting to the immediately preceding code or structure.” The monotype process shares some characteristics with painting and some with printmaking, and offers speed and spontaneity while expressing ambiguity, allusion and contradiction. Degas’ work is considered the most influential in this medium, and Weisberg’s group of monotypes from 1990 alludes to his imagery, which explores intimate personal rituals such as bathing. In Weisberg’s Before the Bath, she portrays a figure kneeling beside a large circular basin near the leg of an easel, establishing the setting as the artist’s studio. The limited palette and the distance that a printed image establishes enhances the contemplative quality of the figure and the timeless nature of the piece. Artist and USC alumna Laura Howe modeled for the piece. “An artist like me, whose work refers in technique and universal themes to traditional past art styles, has to ask how this process of reinventing the past unfolds – how artists can continue to make art that is innovative and meaningful while maintaining a relationship with the history, values and culture that got us here,” Weisberg said. Weisberg’s work is included in the collections of such notable museums as the Metropolitan Museum of Art, the Whitney Museum of American Art, the National Gallery in Washington, D.C., the Chicago Art Institute, the Bibliotheque Nationale of France and the Instituto Nazionale per la Grafica in Rome. Weisberg’s work was also included in a recent exhibition at the Los Angeles County Museum of Art, “End of the Century: Prints Since 1970 From the Collection.” The show surveyed the last 30 years of printmaking activity, primarily in the United States. In a section called “Art About Art,” Weisberg’s 1989 monotype Giacometti was exhibited alongside prints by artists Jim Dine and Roy Lichtenstein. * The Judson Gallery is at 200 S. Avenue 66 in Los Angeles. Hours are 9 a.m. to 4 p.m., Tuesday-Friday; noon to 4 p.m, Saturday. For more information, call (213) 258-2800. * The National Museum of American Art is in the historic Old Patent Office Building at Eighth and G Streets in Washington, D.C. Hours are 10 a.m. to 5:30 p.m. daily.